Home / coiningai / cryptocurrency / Don’t shoot for a Lamborghini, shoot for a Tesla instead! Most people (specially new traders) in cryptocurrency trading world want to get really rich overnight (and many want to buy a Lamborghini with that money :D). Making a lot of money overnight makes things much riskier (even in the standard of cryptocurrency trading), making people eventually lose all their money. Everyone thinks they can get out of it at the right time, but most people can not. I hope people will be more cautious after the Bitconnect fiasco. Just read some reddit posts. This is really not funny. Instead of a Lamborghini (cheapest one is around $200K), we recommend investors to shoot for a Tesla (cheapest one is around $35K), i.e. you reduce your risks by investing wisely avoiding big crash with a (and not waiting for the biggest cash out) periodic cash out and becoming rich enough to buy a Tesla (or whatever interests you).Who knows, may be one day with your periodic gains you can buy a Lambo too! In our last post, we introduced a few price tools that we developed at http://coining.ai, which can help understand the prices of cryptocurrencies better. However, it might not be obvious to many new traders how to best utilize those price tools for investment. In this short post, we will show how to best utilize our tools. 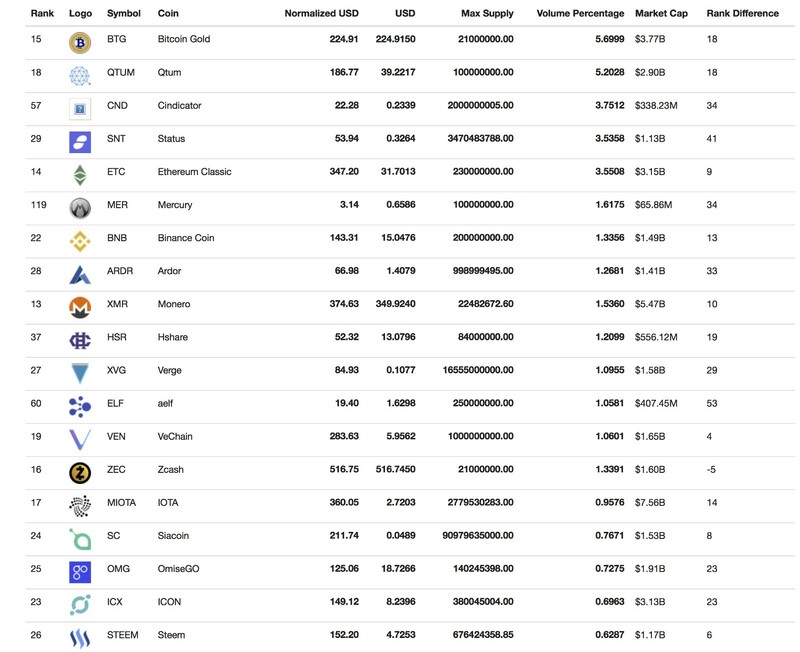 It shows top coins based on market cap (based on current supply), normalized price (based on total supply) and trading volume. If you want to use HODL some coins for long term, start with coins from top 10–15 in this list. Then do a little more research on these coins to select which ones you want to invest in. These will be safer investments in the crazy crypto land. It is not guaranteed that 2018 will see the same return, but this certainly is safer than other alternatives. I cannot stress this enough, do your research on each coin you want to invest in. I would recommend to select top 15 and remove some coins from the list and invest in your 10 selected coins out of the top 15. My personal top picks are (sorry 12, not 10): Bitcoin, Ethereum, Litecoin, Ripple, NEO, Stellar, DASH, EOS, NEM, IOTA, Cardano, and Monero. I do not invest equally in all the coins. We will have another post later on detailed portfolio management. I have invested in decent amount in these top coins, with majority of my investments in Bitcoin, Ethereum, Litecoin and Ripple (roughly 60% of my long-term portfolio), then the rest of the coins about 35%. The other 5% is for some prospective alt-coins. You have to come up with your own game plan. Personally, I am a little conservative in terms of risk taking, so majority of my investments are for what I think are very good coins already and also have very good futures. The ones with great return potentials are the ones that are not too well established yet, at the same time, you can lose more as well. So it depends on how much you are willing to risk. You can equally divide the risks as well, which worked great for 2017. Good buys from coining.ai/goodbuys.html. Screnshot taken January 18. 2018. Good coins to buy are coins with very good volumes, but the normalized price is currently not too high. For good buys list, we are considering coins out of top 10 with minimum volume of 0.1% of Bitcoin trading volumes. You can buy some coins from this list, as they can potentially increase in price given their trading volumes. It is very important to do your coin research. This tool is giving you a short-list to start from. Then find out which of these coins have actual potentials. Then you invest in those coins. You define, what is a decent profit for you — it could be say 30%, 50%, or it could be a few multiples — 2x, 3x, 5x, 10x. As soon as you get a good amount of profit, you sell some. You do not want to wait for a significant increase ( i.e. 5x) to sell all of it. It could get to 4.8x and then dip again. You want to make periodic profits. So you define your levels — say 30%, 50%, 100% (2x), 3x, 5x, 7x, 10x, 15x, 20x, 50x, 100x. Every time the price reaches a level or around that level, you sell some. This strategy can be used for the top coins (http://coining.ai/coins.html) as well. My recommendation is you buy a portion of top coins for long term and then keep a portion to get periodic profits from some additional coins. With this strategy, you will always want to periodically take out some profits in fiat money. Good buys from coining.ai/goodbuys.html. Screnshot taken January 19. 2018. Many traders are fooled by these coins because they have a huge supply, making the price less than $1. Because of this, the price can very easily multiply and 2x, 5x, 10x, 100x or even 1000x return is very common. However, these are the riskiest coins as well, because many of these coins suddenly get huge market caps. When people start to realize that, the price drops significantly. You are trading with market psychology here. So you can gain a significant amount, but you can lose a significant amount if you do not get out before everyone else. No one can do that but some people are just randomly lucky. So selling periodically to get your gains at every levels is very important for these coins. Doing fundamental analysis for these coins is the most important. If you buy a garbage coin, just because the price is low, it can just go to zero the next day. We filter complete garbage coins from the list by considering the trading volumes and also sort the results by combining trading volumes and normalized price (lower price is better, because it has more potential to increase). You still want to be very careful. Prospective alt-coins from coining.ai/altcoins.html. Screnshot taken January 19. 2018. How to combine all of these strategies? You divide your resources into 3 buckets for 3 of these strategies. Then you divide how much you want to invest using each strategy. Here are some use cases and how you could invest. You change the numbers based on your priorities and style. Use case 1: Someone very busy and just wants to invest and forget. Put 100% of your money for long-term “safer” investment strategy. Use case 2: Someone busy and do not have time to monitor coins very frequently, but can check every few weeks / months. Put 80% of your money for long-term “safer” investment strategy, and 20% of your money for medium-term investments. Use case 3: Very interested in cryptocurrency trading and can monitor frequently, but not a big risk taker. Put 75% of your money for long-term “safer” investment strategy, 20% of your money for medium-term investments, 5% of your money for some quick gains with short-term investments. Change these numbers based on how much you are willing to risk. Use case 4: Very interested in cryptocurrency trading and can monitor frequently; also a big risk taker. Put 50% of your money for long-term “safer” investment strategy, 30% of your money for medium-term investments, 20% of your money for some quick gains with short-term investments. Even for the big risk takers, I would recommend to use not more than 20% of your portfolio to include for these alt-coins. You do not want to invest in the next Bitconnect and lose it all. If you are an experienced trader, you can certainly do it differently and probably in a better way. These investment strategies are primarily for new traders. However, the tools can be very well used by experienced traders. After you know which coins to invest in, you want to find the perfect time to buy and sell those coins. If you have the time, energy and skills, use technical analysis at sites like www.coinigy.com to find the best time to buy or sell. If you do not have the time or energy, we are also working on a product for you. If you are interested in that 24/7 price monitoring product, join the waitlist at http://coining.ai and follow that product’s twitter @daycoining and company twitter @CoiningAI for updates on that product. NEVER INVEST MORE THAN YOU ARE WILLING TO LOSE. Diversify your portfolio to diversity your risks. You MUST do your fundamental research to find out if its a good coin to invest. You also want to do some technical analysis to find out if its a good time to buy the coin, e.g. you can use RSI, Boolinger Band, MACD or some other indicators. You don’t want to buy them when it has the highest price and the price is going down. Learn these technical analysis to make better decision on when to buy or sell. Always, always, periodically take your gains and convert to fiat money. Today Bitcoin is worth $20K, say your profit is $50K, tomorrow if Bitcoin is $10K, your profit goes to $25K. Bitcoin price will go up eventually, but for many coins that won’t be the case. And even for Bitcoin, sometimes it can take many months to reach the earlier ATH (all time high). You do not want to lose your profit by being too greedy. Have fun trading cryptos! Happy Coining. P.S. Not responsible for any trading loss. Please consult your financial advisor for suggestions.